Saturday was a great day for an airshow. Blue skies with some puffy clouds provided a beautiful background for the aircraft in flight over the Waukegan airport. The 70 degree temperature and a brisk breeze made it cool out on the ramp but I prefer that to sweltering in the heat. All the pilots handled the rather stiff crosswind well and put on a great show. Georgia and I got to the airport early so that we could walk around the static displays and get some lunch before the show started. 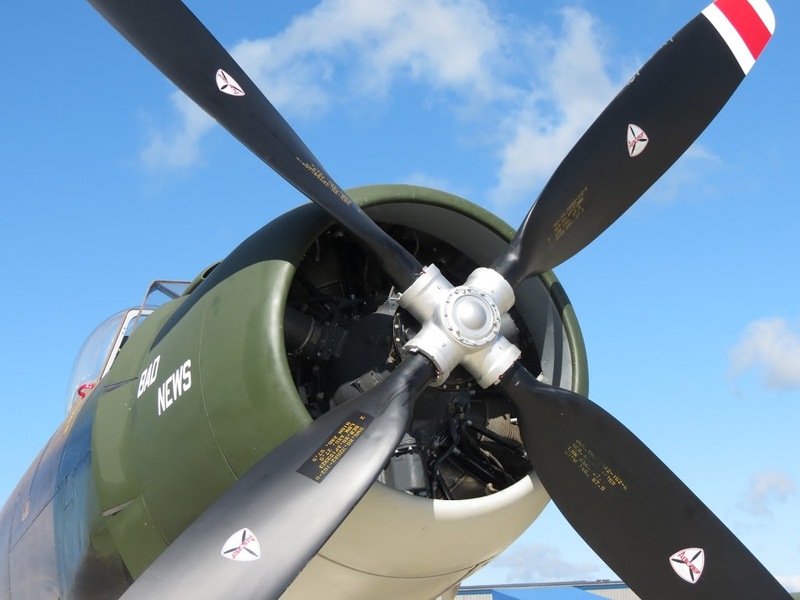 Waukegan is one of the few shows that allows the spectators to get up close to the show airplanes. The exception this time was the Canadian Snowbirds. Those jets were roped off from the crowd. 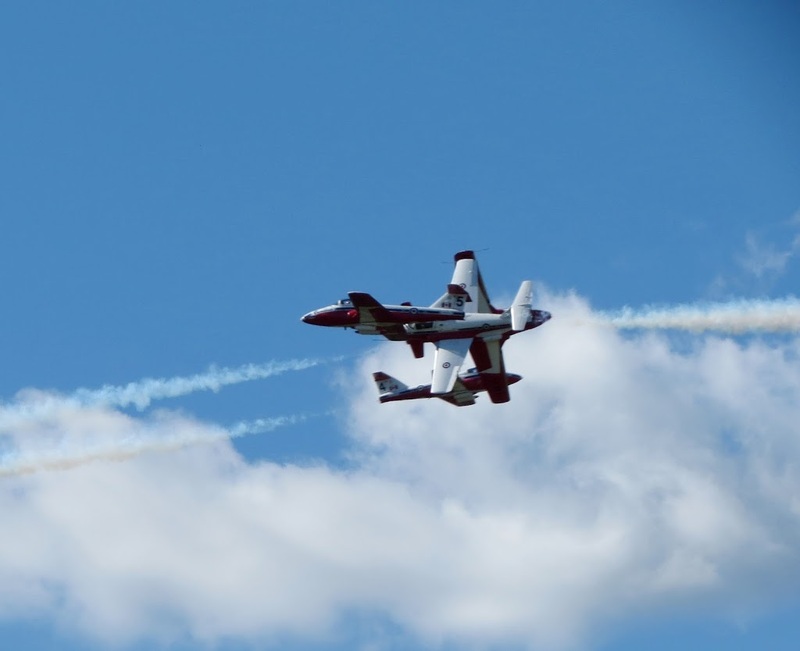 The show started off with the Liberty Parachute Team presenting the American flag while escorted by the three ships of the Aerostars Aerobatic Team. 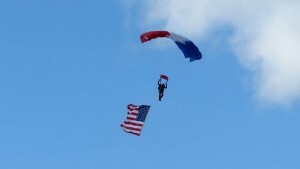 The skydivers came down right on target despite the wind. Next up was Dave Dacy in the 500 horsepower Stearman. 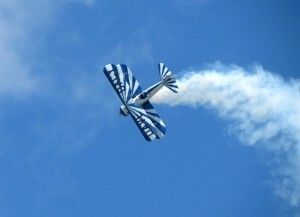 That big biplane powering through loops and rolls is an example of what airshows where like back when aviation was new. It is just a joy to watch. 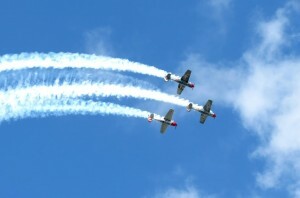 Dave was followed by the return of the Aerostars who came back into the airshow box to perform their full team aerobatic routine. This group flies some very tight formations. They go through maneuvers like they were glued together. 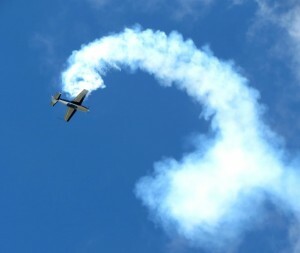 With smoke on, Michael Vakin took off in his Extra 300 and treated us to his fast paced and high energy routine. Mike throws that little airplane into seemingly impossible positions as he tumbles through the sky. Most of his recoveries are just a few feet off the runway. 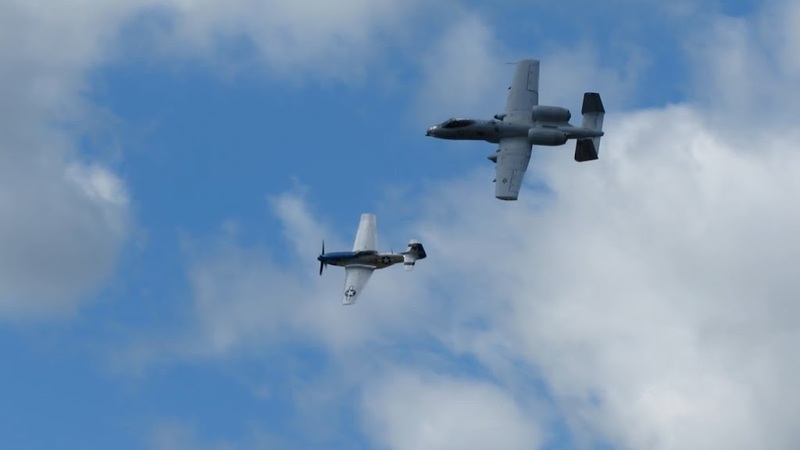 The A10 East Demonstration Team and Vlado Lenoch in his P51 Mustang named MoonBeam McSwine came overhead in formation for the Air Force Heritage Flight. The aircraft separated after the flybys and then each came back to fly demos of the aircraft. 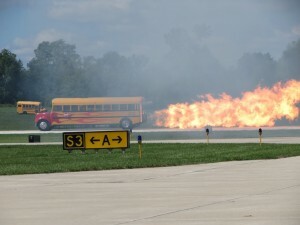 Now we changed our view from the sky to the ground as Paul Stender showed off his jet powered school bus. After a few runs up and down the taxiway, Paul moved to the runway for a race with the P51 Mustang. The bus won of course – at least for this run. In another example of old time airshows, Dave Dacy took off again but this time with wingwalker Tony Kazian out on the lower wing. 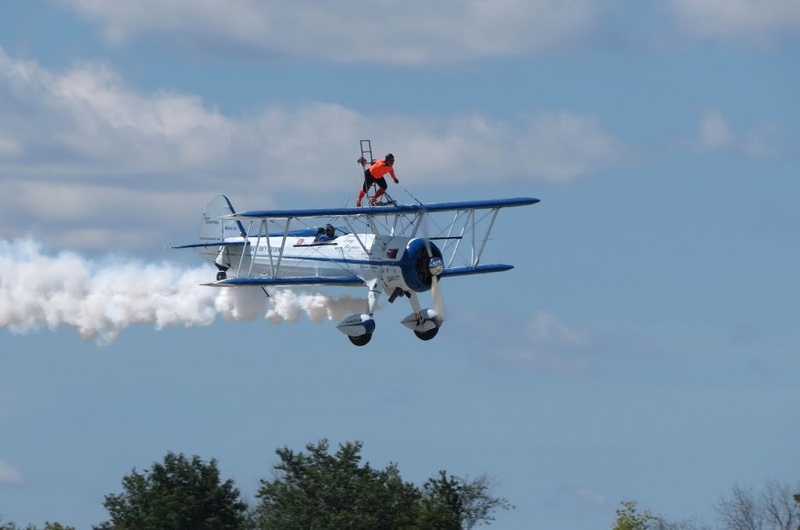 As Dave made pass after pass, Tony moved to the top of the upper wing and performed his freestyle wingwalking routine. 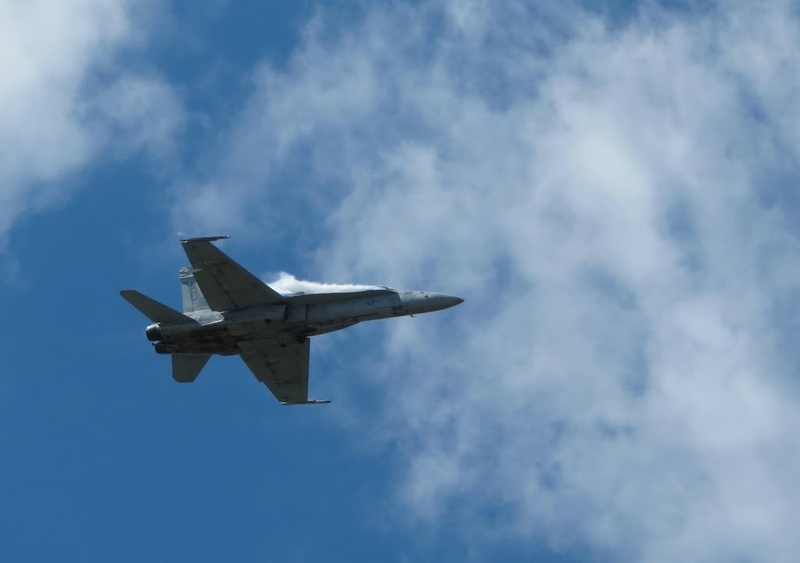 A roar of jet engines from behind us announced the arrival of the F/A-18 demo flight from the US Navy Strike-Fighter Squadron 106. The Super Hornet tore through the sky in high speed passes and seemed to hang nearly motionless in the slow speed configuration. 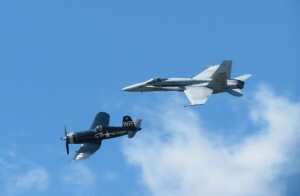 A second F/A-18 then joined in formation with an F4U Corsair for the Navy Legacy Flight. 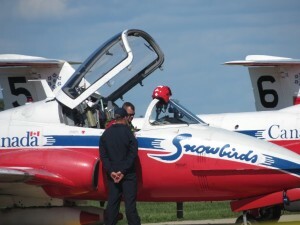 Again, both aircraft returned for a few demo passes before the sky was turned over to the Canadian Forces Snowbirds for the show finale. The Snowbirds began with the march down the flight line as the pilots and crew chiefs manned their aircraft. The team brought nine show airplanes and two spares. All nine pilots started their engines in unison and the team taxied to the active runway for takeoff. As the last jet took off, the team announcer told us that the flight leader had experienced a bird strike on climb out and would be returning to switch to one of the spare airplanes. The exchange went pretty quickly and then it was showtime. Nine CT-114 Tutor jets came from behind the crowd and flew low over us in a tight formation. I didn’t keep count, but the announcer assured us the team performed over fifty formations and maneuvers during their fantastic show. 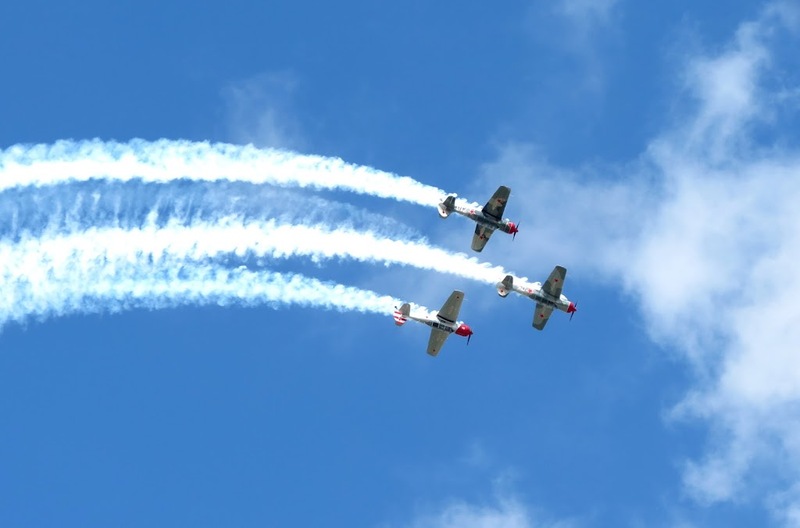 The team flies very tight formations in various combinations of from two to all nine aircraft. Those formations are interspersed with low and close passes by the solo pilots. They are occasionally joined by two other pilots for four ship seemingly head on passes. The show concluded – too soon – with the teams signature nine ship bomb burst. This was a wonderful day at the airport and, probably, the best Wings Over Waukegan yet! We will certainly try to be back next year to see how they top it. 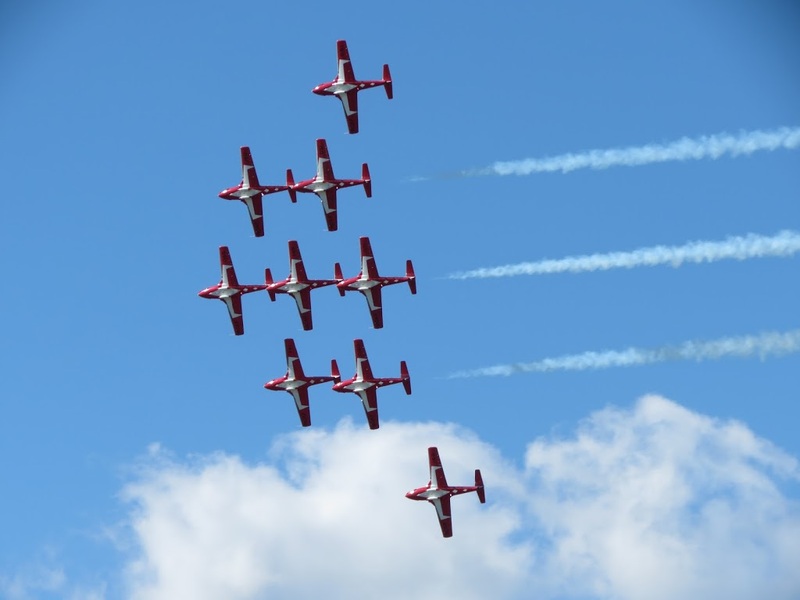 I watched most of the Snowbirds show from my front yard (had a home repair project and didnt’ want to fight parking – how was it?) and had a couple good passes right over our house. One thing I noticed, which you don’t see very often, was that for one of the 9-ship loops, one of the outside aircraft (left from my perspective, show right) broke WAY wide. As if he’d gotten shaky and though better to peel off and live to fly another day. Of course, I think he chose wisely. Probably few others noticed. I don’t know how I missed this comment but thanks Oblivion. Parking was easy but then we got there early. Leaving was the hard part. Slow getting out to the main road.